Romania is a country of wines and grape harvesting has always been an opportunity for merry-making. Battles and important business at the princely courts were postponed, and the lords settled camp amid vines, with Gypsy orchestras resounding high and low. Cries of joy and folk dances heralded the birth, in oak barrels, of the much expected new wine, which in a matter of days, turned into wine. In the lands of Wallachia, Transylvania and Moldavia- the historical provinces of Romania- numberless and famous wines are produced, some of them having been met at the tables of several royal courts of Europe and not only. The famous Romanian Cotnari wine from Moldavia, was one of the favorites wines of the tsar Peter the Great. One of the oldest occupations of the Romanians was the vine-growing. From all parts of Europe, Tracia was considered the oldest and respected area for its wines. It is believed that Tracia was the birthplace of the god of wine - Dionysus.Tracia was the homeland of the Dacians - the Romanian ancestors. In the 1st century BC, the Dacian king, Burebista, ordered to be destroyed all the vineyards and drinking wine was forbidden. This drastic measures were taken in order to prevent the intemperance of his people and also to avoid the migratory people's attack, especially from the East, who came here attracted by the famous vineyards and not only. Beginning from the 19th century new varieties like Sauvignon, Pinot gris, Chardonnay, Cabernet Sauvignon, Merlot, Muscat Ottonel , have been added to the natives ones because of the vine disease that spread all over the country.The assortment for the white wines are dominated by three varieties, two of them are natives and one is foreigner : Feteasca albă, Feteasca regală and Italian Riesling. For the red wines the Cabernet Sauvignon and Merlot varieties have a great extension. From one end to another , Romania is a real kingdom of Bacchus plant. 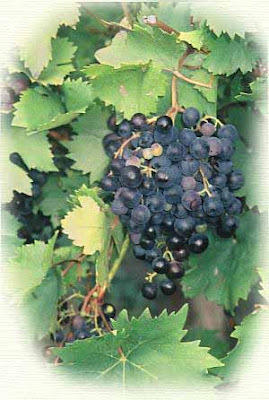 In Moldavia there are the vineyards of Cotnari that contain largely native varieties of Tăm�ioasă Rom�nească, Fr�ncuşă and Feteasca albă. In the very heart of Moldavia, extending over seven hills, lies Iaşi, the old capital of Voivodes, a symbol city of Romanian culture. Surrounding this are the vineyards of Copou and Bucium, producing wines like Aligote, Riesling and Muscat Ottonel. To the south, near Prut river, lies another famous vineyard of Huşi, producing Busuioaca de Bohotin of delicate flavour and nuance. The vineyards of Nicoreşti and Panciu produce Băbească and Panciu, and the vineyard of Odobeşti bottles Galbena de Odobeşti. Wallachia has famous vineyards at Dealu Mare, Valea Călugprească, Pietroasele, Ştefăneşti, Drăgăşani and Segarcea with excellent red wines. The vineyards of Transylvania and Banat have provided for centuries wines for the imperial court of Vienna. From Teremia, Recaş, Miniş, Tarnave and Silvania came varieties with names as rich as they tasted : Majarca, Creaţă, Steinschiller (these are native varieties of white wines), Traminer roz, Fetească Albă, Fetească regală, Savignon, Pinot gris, Muscat Ottonel. In the region of Dobruja , the land between the Danube River and the Black Sea, lie the vineyards of Oltina and Medgidia, Murfatlar and Niculiţel with some remarcable wines like Sauvignon, Merlot, Pinot Noir,Riesling, Pinot gris, Aligote, Muscat Ottonel and Chardonnay.